Daddy Design is a social-media design company that does really fantastic work, including WordPress website and blog design, Facebook page design, and Twitter profile design. It designed this website and several other websites for SixEstate clients. 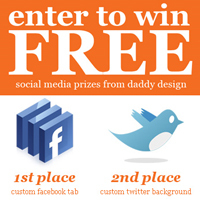 The owner of Daddy Design asked me to pass along details of a contest the company is running to give away a free Facebook tab design or Twitter background. All you need to do is follow the few quick steps on its contest page — and the winner will be picked at random. It’s that simple.